As promised, I’ve completed the third section, as well as a short addendum to the second section, of my article on how experimenters at the Large Hadron Collider [LHC] can try to discover dark matter particles. The article is here; if you’ve already read what I wrote as of last Wednesday, you can pick up where you left off by clicking here. Meanwhile, in the last week there were several dark-matter related stories that hit the press. There has been a map made by the Dark Energy Survey of dark matter’s location across a swathe of the universe, based on the assumption that weak signals of gravitational lensing (bending of light by gravity) that cannot be explained by observed stars and dust is due to dark matter. This will be useful down the line as we test simulations of the universe such as the one I referred you to on Wednesday. There’s been a claim that dark matter interacts with itself, which got a lot of billing in the BBC; however one should be extremely cautious with this one, and the BBC editor should have put the word “perhaps” in the headline! It’s certainly possible that dark matter interacts with itself much more strongly than it interacts with ordinary matter, and many scientists (including myself) have considered this possibility over the years. However, the claim reported by the BBC is considered somewhat dubious even by the authors of the study, because the little group of four galaxies they are studying is complicated and has to be modeled carefully. The effect they observed may well be due to ordinary astrophysical effects, and in any case it is less than 3 Standard Deviations away from zero, which makes it more a hint than evidence. We will need many more examples, or a far more compelling one, before anyone will get too excited about this. Finally, the AMS experiment (whose early results I reported on here; you can find their September update here) has released some new results, but not yet in papers, so there’s limited information. The most important result is the one whose details will apparently take longest to come out: this is the discovery (see the figure below) that the ratio of anti-protons to protons in cosmic rays of energies above 100 GeV is not decreasing as was expected. (Note this is a real discovery by AMS alone — in contrast the excess positron-to-electron ratio at similar energies, which was discovered by PAMELA and confirmed by AMS.) The only problem is that they’ve made the discovery seem very exciting and dramatic by comparing their work to expectations from a model that is out of date and that no one seems to believe. This model (the brown swathe in the Figure below) tries to predict how high-energy anti-protons are produced (“secondary production”) from even higher energy protons in cosmic rays. Newer versions of this models are apparently significantly higher than the brown curve. Moreover, some scientists claim also that the uncertainty band (the width of the brown curve) on these types of models is wider than shown in the Figure. At best, the modeling needs a lot more study before we can say that this discovery is really in stark conflict with expectations. So stay tuned, but again, this is not yet something that in which one can have confidence. The experts will be busy. Figure 1. Antiproton to proton ratio (red data points, with uncertainties given by vertical bars) as measured by AMS. AMS claims that the measured ratio cannot be explained by existing models of secondary production, but the model shown (brown swathe, with uncertainties given by the width of the swathe) is an old one; newer ones lie closer to the data. Also, the uncertainties in the models are probably larger than shown. Whether this is a true discrepancy with expectations is now a matter of healthy debate among the experts. I didn’t read the article on April 16th so it may have been updated bit now says. Dr Thomas Kitching, a co-author of the study from University College London, said: “What we measured, with high significance, is an offset between the light emitted from the galaxies in this cluster, and the total mass. 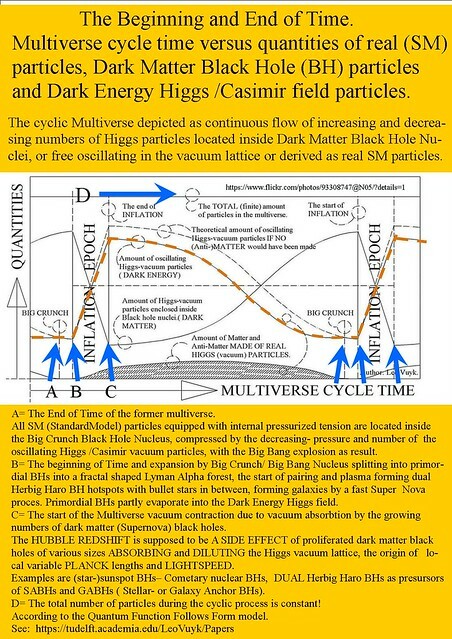 I think it may be premature to assume, or even to operate on the premise, that dark matter represents a particle. Gravity has not yet been unified with the Standard Model and that is an important point. One thing that can possibly be agreed upon is that all phenomena can be represented as field excitations even if there is not yet any kind of rigorous mathematical interrelatedness of the different field excitations that also includes gravity. A very good point of departure for investigating dark matter may be Twistor Theory. Gravity, in general, is a stochastic theory in the bulk where large groups of particles are represented. Twistor Theory represents those individual particles interacting with the background of space during acceleration. It is an extremely local twisting translation movement that would be impossible to detect without interrupting the twistor action itself. Energy is given or taken away from all particles during these group accelerations of particles and manifests as the change in twistor action on each individual particle. The energy gain or loss from changes in twistor action during acceleration can be represented as Gravitons. Again, the twistor action can be viewed as a stochastic effect that would show up (if we could detect it) as a lengthening path during acceleration due to the twisting moment. Twistor theory is a good stand in for gravity and the exchange of gravitons with the background field during acceleration. It may be that dark matter doesn’t represent the existence of a particle at all. If you could stop the twisting action of individual particles during acceleration where would that energy go? If you stopped a particle from twisting during acceleration it would be accurate to say that the acceleration did NOT change the energy of the particle and its La Grangian wouldn’t change. Instead the force causing the acceleration would organize the background field to constant energy of the particle throughout its path. The effect would be to create a soliton or bridge between the two points where the acceleration started and stopped. You could also call it an axion. This is an extremely good candidate for dark matter. It would represent a stochastic effect of small bits of energy removed from large masses of particles during accelerations. It would represent highly organized areas of the background field where energy was diverted from the normal twistor effects that occur during acceleration. It couldn’t rightly be called a particle at all. As far as how I spelled lagrangian above, I think I may have been listening to too much ZZ Top lately. for dark matter annihilation and would fall for secondary production? Involved and controversial. Notice the difference between prediction and observation is only factor of 2-4 — not s huge. Einstein had the notion of curved spacetime. That’s what the Milky Way’s halo is. At the level of the Milky Way (a galaxy), Newtonian gravity is sufficient to describe its behavior. Einstein equations are not required at this level. It is why MOND (Modified Newtonian Dynamic) is able to account for the flatness ot the motion of stars far from the center. By contrast, Einstein’s equations *are* required to explain the bending of light by galaxies, and dark matter is required as well in order to explain how much of it is seen. Because of the diversity of this “gravitational lensing” seen in the universe, it is not easy to figure out how to reproduce all these effects merely by modifying gravity. Spacetime does not have mass when it is empty (no massive particle in a given volume, that is no matter). But it has energy (photons from the CMB, dark energy). It is not the same. Photons are massless. But spacetime is cuved by the presence of matter/enrgy, and for example by galaxies clusters (where there is a lot of matter…). Relativity is phenomenological like Greek “Logos”. There is a close connection between symmetry and objectivity, the starting point once again being provided by spacetime symmetries: the laws by means of which we describe the evolution of physical systems have an objective validity because they are the same for all observers. The old and natural idea that what is objective should not depend upon the particular perspective under which it is taken into consideration is thus reformulated in the following group-theoretical terms: what is objective is what is invariant with respect to the transformation group of reference frames, or, quoting Hermann Weyl (1952, p. 132), “objectivity means invariance with respect to the group of automorphisms [of space-time]”. Debs and Redhead (2007) label as “invariantism” the view that “invariance under a specified group of automorphisms is both a necessary and sufficient condition for objectivity” (p. 60). They point out (p. 73, and see also p. 66) that there is a natural connection between “invariantism” and structural realism. The “dark matter” is not within spacetime. Below Tc, the critical Curie temperature, there exists an infinitely degenerate set of ground states. In quantum field theory (QFT), the ground state becoming the vacuum state, we live in one of those vacuum states, Dark matter is in another. This means that there may exist symmetries of the laws of nature which are not manifest to us because the physical world in which we live is built on a vacuum state which is not invariant under them. In other words, the physical world of our experience can appear to us very asymmetric, but this does not necessarily mean that this asymmetry belongs to the fundamental laws of nature. SSB offers a key for understanding (and utilizing) this physical possiblity. Goldstone theorem. In the case of a global continuous symmetry, massless bosons (known as “Goldstone bosons” – is like Immanuel Kant’s TRANSCENDENCE) appear with the spontaneous breakdown of the symmetry according to a theorem first stated by J. Goldstone in 1960. The presence of these massless bosons, first seen as a serious problem since no particles of the sort had been observed in the context considered, was in fact the basis for the solution — by means of the so-called Higgs mechanism (see the next point) — of another similar problem, that is the fact that the 1954 Yang-Mills theory of non-Abelian gauge fields predicted unobservable massless particles, the gauge bosons. Relativity, Uncertanity principle, and Higgs mechanism were all the same in context with creation of Mass – depends on “degree of freedom”, created by the Goldstone bosons – what we call spacetime, 3D flat universe and masslessness of photons ? I agree. I was just saying that to describle the visible halo of a galaxy (that is nebula), you only need classic newtonian dynamic. But for the “gravitional lensing” effect, general relativity is indeed needed. Concerning MOND, there exist some attempts to buld a relativistic version, for example Tensor-Vector-Scalar theory, which could eventually also reproduce the lensing effect. What is curious about MOND is that it is also able to reproduce the empiric Tully-Fisher relation between intrinsic luminosity of a spiral galaxy and its rotation velocity. So why not something else than dark matter to explain what we see ? The door is not completly closed, I think. I agree it is not closed, and it won’t be until and unless the objects that make up the dark matter are identified, or a completely different hypothesis is confirmed. Hmm, when I first saw the Antiproton to Proton ratio graph I thought it was a graph of the expected speed of stars in a typical galaxy (which would be expected to fall off with distance) versus the observed speed which is surprisingly flat – and the basis for the existence of dark matter. How about the other two graphs from AMS for proton flux and helium flux? They appear more definitive than the graph shown yet equally unexpected. Will newer calculations also bend those expectations closer to AMS observations? Yea physicists love symmetry – the same way a guy tells his wife he loves her – from his mistresses house. Actually, physicists may or may not love symmetry — but nature does not. That’s a long discussion. You’re mixing many things here. There’s evidence FROM DATA that there are unequal numbers of baryons vs. antibaryons, and of leptons vs. antileptons, in the universe. Moreover — leaving aside “Conservation of Baryon Number” [which is NOT exact even in the Standard Model — a subtle point — so it was not thrown under the bus, it was never there to start with] — we already know that there is CP violation in nature, that’s from data. So we already know that some particles are treated differently from their antiparticles. Whatever you choose to buy or not buy is not the point; the question is whether you put your personal preferences first and data second. Is this indeed your approach? Because your comment suggests that it is. Galileo tried to put data first and it got him into trouble with the church, because they didn’t like that. As for dark matter vs. AMS results; the AMS results are the first of their kind. When dark matter was first proposed, it was also treated with great skepticism. It is only because decades of different kinds of data have supported the notion of dark matter — data from the cosmic microwave background, from the distribution of galaxies, from the motion of galaxies within clusters and stars within galaxies, and from the bending of light by galaxies halfway across the universe — that dark matter has become highly plausible. You should not confuse a new isolated result with an long-standing, wide-ranging collection of results. They are in very different places along the continuum that extends from hint through evidence and plausibility to established fact. It’s a very small effect, except at high temperatures — i.e., irrelevant today, but not necessarily irrelevant in the early universe, which is when the baryon excess over antibaryons was established. The only reason this can’t be the whole story for the excess is that (a) there’s not enough CP violation in the Standard Model, and (b) the phase transitions in the early universe wouldn’t have been violent enough, if the Standard Model is correct, to generate a significant excess of baryons. But there IS enough baryon number violation! In this case, in order to maintain my ultimate belief in symmetry I assume that any observation or experiment indicating a violation of perfect symmetry is ‘local’ – meaning, if we were in an antimatter dominated sector of our universe (or perhaps an antimatter sister universe) we would find just the opposite: Physicists in the antimatter dominated region would insist that observations and experiments favor antimatter over matter. For example, a particle decay rate skewed slightly in favor matter over antimatter or the reverse would depend on the sector of the surrounding universe it finds itself in. And yes, this implies a (admittedly mysterious) link between the very small and the very large. This possibility — that the universe has hidden symmetries that are made up for in other extraordinarily distant parts of our universe, or right here but made up for in “hidden sector” particles that interact with us only gravitationally — is certainly not excluded by data. And indeed, you would not be the first person to consider it. But don’t ever lose track of the data. Why is so hard to show that except from giant central black holes, there also exist lots of giant black holes just around galaxies in the form of dark matter black hole halo point sources? How can you assert that there exist black holes formed from hypothetic dark matter, as no dark matter has yet been discovered ? And “dark matter black hole halo point source”, it is just non sense verbiage. Your link point to a “Quantum FFF theory” (“Function Follows Form”) site you wrote and just invented alone. It is not a scientific theory. Well, people do consider the possibility that dark matter is actually made from black holes that formed in the early universe. The problem is to make them; what could cause them to form? Also, there are many measurements that constrain this possibility to a limited range of black hole masses. Gravitational lensing could be a problem for such an idea; people looked for MACHOs (massive compact halo objects) and didn’t find enough of them to make up the halo. With the halo I suggest also the global outskirts of a spiral galaxy where we find globular star clusters and dwarfs which seem to be build around central Bhs. The Milky Way moves through and displaces the dark matter. The Milky Way’s halo is displaced dark matter. Nice article in the pingback. It is something about space itself. ‘Space’ has mass. This mass is displaced by the particles which exist in it and move through it, including ‘particles’ as large as galaxies and galaxy clusters. The major difference in this way of thinking is it allows us to understand what curved spacetime physically manifests itself as. The Milky Way is displacing the mass which fills ’empty’ space. The state of displacement of the mass which fills ’empty’ space is curved spacetime. “the dark mass, not dark matter, let alone to say about the ‘dark particle'”. If dark mass exists, then it is dark matter. For example, il sterile neutrinos exists, they won’t interact at all with ordinary particles via strong force, electric force (they are neutral), or even weak force. But if they have mass, they are matter and will be sensitive to gravity (they won’t fly at speed of light and their rest mass would be m*c²). The whole point of the article is to understand dark mass is different than dark matter and the notion of a dark matter particle is pure speculation. So if it not dark matter, you have to change gravitation laws, that’s the only alternative, but with strong constraints. Matt never said that dark mass is different from dark matter. If dark matter does not exist, there is no dark mass, but a different law of gravity. If you respond my silence is not agreement. You cite yourself, and then ? I understand that you cite your own theories, not Matt article. Try to weight “space” on a balance… matter has mass, not space (empty)..
“Dark mass” is an awesome label for the mass that fills ’empty’ space. Are we ready to understand it is the dark mass that waves in a double slit experiment, or still too soon? What about what is thought to be virtual particles being the chaotic nature of the dark mass? The “subquantic medium” is the dark mass. A “fluidic pilot-wave system” is the dark mass. What waves in a double slit experiment is the dark mass. Instant Broglie- Bohm Pilot Waves, the Origin of all Entanglement Effects in the Lab and Wavefunction Collapses in our Universe as related to our opposing Anti-COPY UNIVERSE(S) according to Quantum- FFF- Theory. I define mass as that which physically occupies three dimensional space. ‘Empty’ space has mass which is now referred to as ‘dark mass’. Dark mass is displaced by the particles of matter which exist in it and move through it. Mass is equivalent to energy right? So I think dark energy occupies 3D space.in the form of a masless but energetic oscillating Higgs field as the engine of Casimir effect and partly pressure gravity in combination with the opposing pressure of gravitons..
“Empty’ space has mass which is now referred to as ‘dark mass””. The vacuum Higgs field can have resistance for spinning Fermions,however by Lorentz polarization and Bohm Vigier guidance ( multiverse entanglement) they are compensate the resitance. Energy and mass are not the same thing. Three dimensional space is filled with dark mass and particles of matter. A change in state of the dark mass or the matter which exists in it is energy. Dark mass is displaced by matter. The state of displacement of the dark mass is curved spacetime. The state of displacement of the dark mass *is* gravity. We are discussing very different concepts. I will most likely not respond to your next post. Mass is a relativistic invariant : p^2 = m^2 (I set c=1). Show me that your space is also a relativistic invariant. Thre is a contraction of lentgh with speed (l = (1- v^2/c^2)^(1/2)*L). So, any (space) volume is not relavistic invariant. Also good luck to you. To be more specific IMHO, empty vacuum Has no mass only Higgs field energy resulting in Casimir effect. All Dark matter is concentrated in Black Hole nuclei from small upt giants located also around galaxies. 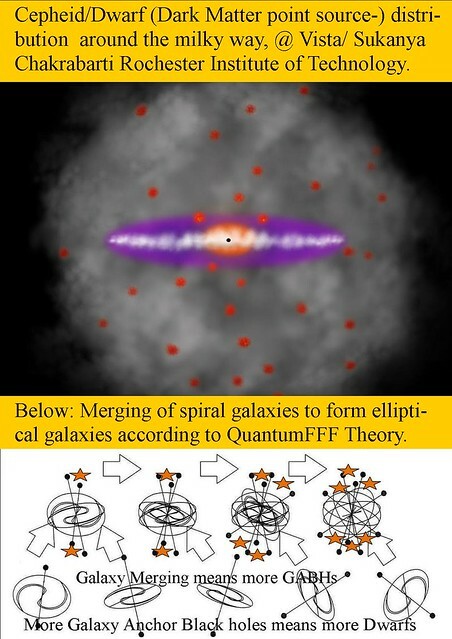 Black holes and consequently Dark Matter is the origin of electro magnetic currents ( Birkeland Alfven current circuits) around some stars and all galaxies. I posted a comment in the pingback article describing the relationship between dark energy and dark mass. “How does a field give mass to particles? Let’s create a electric field in a region, lets assume there are two large capacitors and the two capacitors are far apart, so now we live in a world made up of an electric field. Hence, when bipolar particle is goes through it it will be polarized up or down creating a difference in its energy (mass) …” Leonard Susskind in one of his lectures on demystifying the Higgs boson. First, I must say, I wish I had him as my physics professor when I was going through, simple and straight forward explanations of very intricate concepts, excellent! So, “… lets assume there two large capacitors plates…” very interesting, it hit me on the 3rd! viewing of his lecture that could there be a link between dark matter (dark energy) and these hypothetical large capacitor plates? Could these regions of dark matter, when seen in totality with the visible regions, be functioning as the “capacitor plates” that create the field (call it gravitational, or you can call it a strawberry field, what ever, 🙂 ), which creates the quantum fluctuations that give rise to stable particles? Read the pingback article. It refers to the ‘dark mass’ and does away with dark matter and the dark matter particle. Since dark mass exists where particles of matter do not I conceptualize particles of matter as condensations of dark mass. Assuming that dark matter is a “source” for the gravitational field, then could it also be considered as part of the boundary, along with black holes, of space-time? Or another way to think of it would be on one “side” the dark matter at zero (or very close to zero) velocities and on the other side the black holes at extreme velocities (or at or very close to c, the speed of light). If there is any iteration with visible matter then, indeed, it exist and therefore must have a function in the whole scheme of things. No superfluous stuff in nature, I don’t think. And we cannot see dark matter because, simply, our sensors are not sensitive enough nor understanding matured enough to contrive a method of measurement. On this thought, if. indeed, DM is part of the boundary conditions of space-time, then I would think the James Webb Space Telescope, JWST, could verify it by looking at similar patterns in other galaxies and galaxy clusters. So, in fact, there is no structural boundary of the universe, like walls in a room, rather the boundaries are of changes (velocities) of energy density (fluxes). I dare go further with this layman’s speculation, but I will, 🙂 , If this concept would be anywhere close to valid then I believe the universe is NOT flat, open, but a sphere, (not even a shell since no structural boundaries need to exist to explain gravity). By that I mean the polarization required to sustain a gravitational field would be between DM and black holes, which could be at extreme distances or even at very close distances like within a single galaxy. 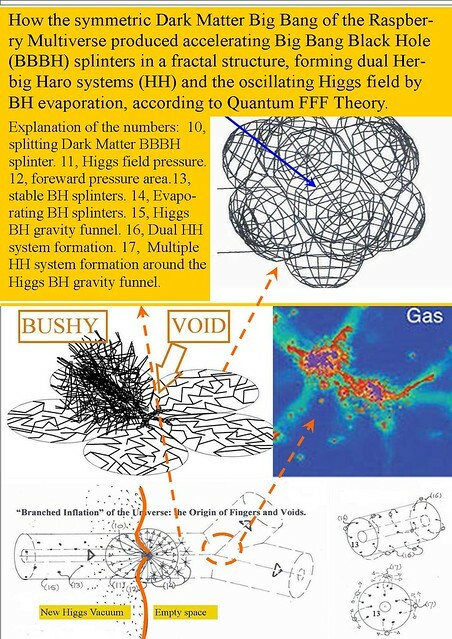 Could these boundary conditions of the gravitational field have anything to do with gravitational lensing and, BTW, the Pioneer anomaly (effect)? To answer your question, I think particles of matter are condensations of the dark mass. When a nuclear bomb explodes matter evaporates into dark mass. The evaporation is energy, mass is conserved. I’m sorry and no offence to your theory. This all sounds fantastic and paradigm shifting….. but can someone who is qualified shed some clarity on this “what waves” buisness please? What is the actuall double slit interpretation? If Matt doesn’t buy it the neither do I!! ….. Could you do a mainstream interpretation article on this Please Matt? I recommend you watch all of the following video. The part having to do with the double slit experiment starts at 2:10. The second thing to remember is that many physicists are hoping for something, anything, new at the LHC. Nobody is sure what will happen but dark matter (Or any new particle) production would be a welcome result. Anything truly surprising, in that it would be unexpected by most physicists would have to be rather exotic, such as micro-black hole production. This graph of “the excess positron-to-electron ratio at similar energies” looks the same as that of “the flat rotation curve of the spiral galaxy”. Is there any paticular reason? Or by chance? It would be very odd if it wasn’t coincidence. There are in fact very few kinds of graphs. (Linear, exponential, cubic…) especially when they are adjusted to look neat enough for a single figure. The result is that it’s quite easy to find graphs that look the same. And what would such a result even mean? There are different curves for different galaxies and for clusters of galaxies, to which would the graph match and why? I think it was Martin Rees who said that one needs only three graphs in order to give any talk in astronomy. The first was a scatter plot. 🙂 The second was a straight line, which one can use for any log-log (or linear, of course) relation. The third was rapidly oscillating, so it could be a spectrum, or white noise, or whatever. but, I have another couple of questions: why isn’t the observer effect regarded as spiritual phenomenon (seriously) and how much do physicists and folk and CERN take this potentially ‘spiritual’ affect into consideration when they explore quanta? –Certainly it could play itself out, potentially, in many more ways than we see simply with light? Maybe other quanta are affected in different ways? PROPOSITION I.Every multitude partakes in some respect of The One. PROPOSITION III.Every thing which becomes one, becomes so by the partici­pation of The One, and is one so far as it experi­ences the participation of The One. PROPOSITION V.All multitude is posterior to The One. …*have *you ever studied metaphysics…? Is the LHC used to create and stock pile antimatter? CP violation was the matter- antimatter balance violation. If electron, positron (antimatter) annihilate, at high energy, produce W, Z bosons. Radioactivity is something (Goldstone bosons?) going towards some antimatter somewhere. At low energy e+, e- => two photons, no problem – they get degree of freedom only to stay in so called spacetime – as massless. But photon Energy => to rest Mass need a “fluctuation (like in string theory), in extra degree of freedom ? Storing e+ in a container is not a problem – but storing antimatter of bosons like Goldstone bosons will be problematic ?